In this photo gallery you'll find a selection of Bagan pictures of late period temples. The late period dates from approx. 1174 to 1300. Late period temples are generally characterised by a multi-storey design. Some temples, as for instance the Dhammayazika pagoda, were built according to a new 5-faced ground plan. 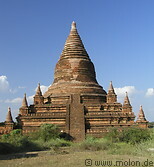 During the later period Bagan was also influenced by Indian temples such as the Maha Bodhi temple.